Plan of the stone redoubt at Niagara Fort in America. The fort was built on the southern shore of Lake Ontario at the mouth of the Niagara River. This was a strategic fort as it controlled access to the Great Lakes. The French built the first military post here in 1679, known as Fort Conti. This was replaced by Fort Dennonville in 1687 and by Fort Niagara in 1726. The British controlled the fort from 1759 until 1796 when it was surrendered to the American forces. The British recaptured the fort in 1813 but it was returned to America in 1815. 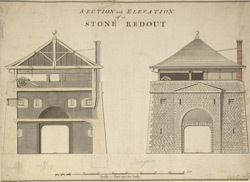 The stone redoubt was built by the British troops to protect the main entrance to the fort and to provide a high platform for their cannons. There are two redoubts at Niagara each capable of holding twenty men.